The Sphenopalatine Ganglion (SPG) is a bundle of nerve cells located behind your nose. It’s linked to the trigeminal nerve, which is associated with headaches and migraines. 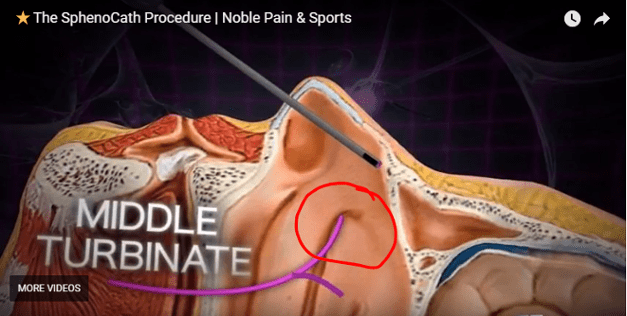 A Sphenopalatine Ganglion block is a procedure that applies pain-relieving medicine (typically lidocaine) directly to the nerves. This blocks pain signals to the brain by reducing the production of norepinephrine. How it works: During the SphenoCath® procedure, a small thin catheter is placed in one of your nostrils. You may experience slight discomfort as it approaches the nasal bone. Once the device is correctly in position, an anesthetic is applied to the sphenopalatine ganglia (SPG). This procedure repeated in your other nostril. Some patients say they have unpleasant taste or numbness in their throat immediately after the procedure. This is the result of swallowing some of the anesthetic and should wear off in a few hours. Avoid eating or drinking to prevent a choking hazard. Others temporarily have difficulty swallowing but are able to swallow and the sensation wears off quickly. Temporary lightheadedness or mild dizziness may occur immediately after the procedure. Most patients go back to their normal activities within 20 minutes. We recommend drinking a lot of water before and after the procedure to improve recovery time. It's a good idea to maintain your normal caffeine intake and avoid strenuous exercise for at least three days following treatment. Most people who have this procedure feel relief almost immediately afterwards. For some people, SphenoCath will NOT be effective due to their individual makeup and reaction to the procedure. The vast majority of our patients report positive results. This procedure provides relief from migraines and headaches where no other treatment worked in the past. If you’re struggling with chronic migraines or headaches, this non-invasive procedure could change your life. Contact us for more information! Listen to Dr. Stephens discuss youth sports concussions live on WIBX 950 AM.